Love pollen hash? So do we. If you have a penchant for cannabis extracts especially the homemade variety get ready to start drooling. The Super Herbal Pollen Press is the low-cost high quality must have hash making tool that’s been missing from your life. Making your own cannabis concentrates has never been more doable for the ordinary decent home grower. There are so many new methods to extract cannabis these days. 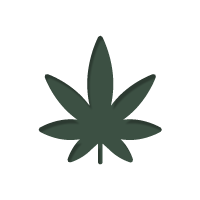 Plus there are incalculable old school ways to refine leaves and buds into high-grade hash. Fortunately, you can find all the tools and equipment you need to refine your marijuana in the Zamnesia Headshop. However, one particular after harvest accessory beloved by commercial growers is oft overlooked by home growers. The Super Herbal Pollen Press is the perfect companion for the Hashmaker Shake Me Pollen Shaker. Not just the pros favourite Pollinator P150. In fact, this handy press can be used to smooth out the edges and reshape all kinds of resinous globules. A compact hash coin is far easier to store and take out with you to a session. Let’s get into the specifics of this clever ganja gadget. The Super Herbal Pollen Press is compact and light weight for such a heavy duty piece of kit. When compressed it’s just 12cm long and 20cm when fully extended. The barrel has plenty of space inside for resin heads. A 3.5cm external diameter with 2.4cm available internally ensures good size coins similar to the €1 coin. Weighing in at a shade under 300g the press is solid and still very portable. The first thing you notice is the neat box the piece comes in. Once you unpack the Super Herbal Pollen Press, you will be struck by the polished aluminium finish. Everything feels solid the barrel, the caps and the T-handle. This baby looks great and is built to last. You don’t have to be an expert to recognise this is a well-engineered piece of kit. It’s made to aircraft spec, so you probably won’t find a more durable pollen press on the market for such a low price. Perhaps the best feature of the Super Herbal Pollen Press is how easy it is to use. The whole unit consists of just four components. The barrel is loaded with pollen or kief or whatever you wish to press. Extending the t-handle fully for loading is recommended, and when you’re done, pop in the insert and screw on the top cap. Finally, by turning the handle, you can press a nice compact coin. The treads are perfectly machined so the pressing really doesn’t require much brute force. It’s pretty smooth, to be honest. Besides you can leave the compacted press to sit for a few hours. Then give it a few more turns for a more compressed coin or puck. To release your immaculately sculpted crystal coin or puck you simply twist off the cap and unscrew the handle. As the Super Herbal Pollen Press is very smooth to operate and incredibly tough it really requires only minimal cleaning and maintenance. In our experience, a dab of 98% alcohol and a cloth will suffice to keep the press working as well as the day you bought it. Simply wipe everything down after you have pressed all of your hash coins. Also, the press comes in a neat box for storage. Priced at just €29.95, the Super Herbal Pollen Press is a bargain for homemade hash makers. This is exactly the kind of after harvest tool that always comes in handy. Especially if you enjoy making your own extracts. A good press will definitely see a lot of action so you need one that’s reliable and precision engineered. This press won’t let you down when you need it. Kief or pollen is the perfect resinous material to press and to ensure a perfect finished hash coin it helps to wrap up the crystals in baking paper. Pressing the material wrapped makes it easier to get a perfect mint. 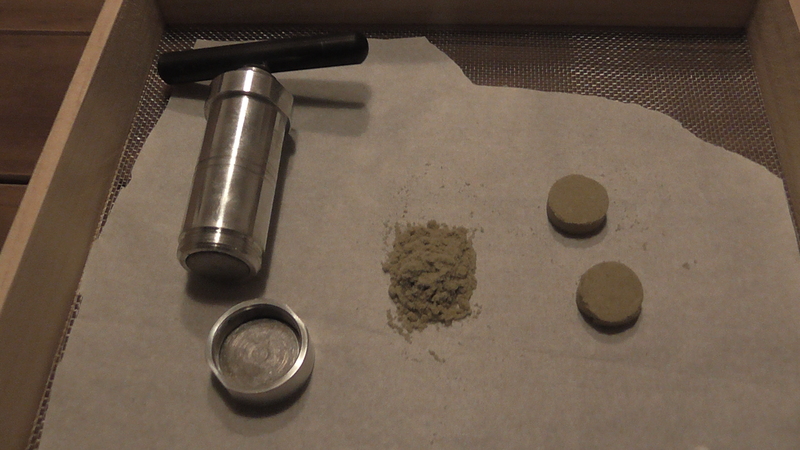 A 5g load is about the max capacity, but you need as little as 1g of pollen to press it into a neat hash coin. Of course, you are not limited to pressing kief or pollen. This piece of kit is pretty versatile. If you wrap up the concentrate in some baking paper, it’s possible to press other extracts. Gooey stuff like Ice-O-Lator hash and wax can be easily pressed into concentrate coins and pucks. Furthermore, to load the pollen into the barrel, we advise using a folded playing card as a scoop to pack with minimal spillage. Loading up the pollen press over a sheet of baking paper is recommended just in case of accidents. You can easily salvage any spilt crystals from baking paper. The Super Herbal Pollen Press is one of the most prudent investments the hash loving home grower can make. This pollen press more than pays for itself in just one harvest. 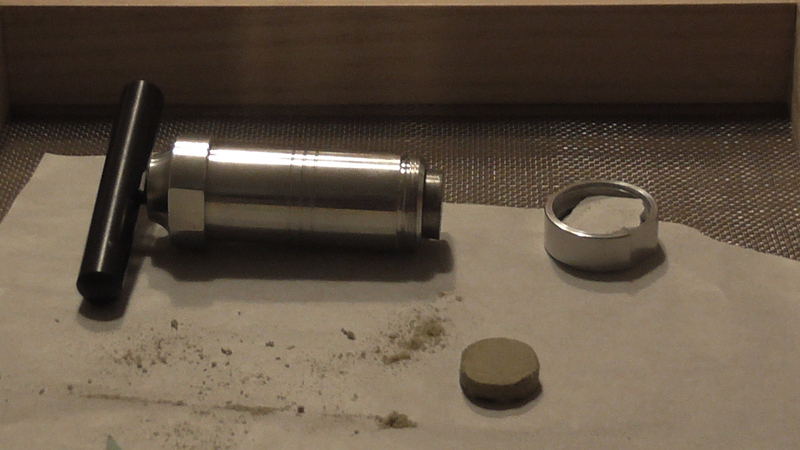 A high-quality pollen press can be the difference between the expert hash maker and the novice. Pro tools of this calibre are easy and fun to use. There really is no good reason not to snap up one of these presses right away. Veteran cannabis cultivator originally from Dublin, Ireland and currently on the loose in southern Spain. 100% committed to Top-Shelf reporting until captured or killed.